The term “Lumbar Support” is one of the most prominent subjects of the Kayak Fishing back pain discourse. This topic mainly arises in those discussions with the consensus that the lumbar spine needs support, which will consequently alleviate back pain. The lumbar spine consists of the stiff vertebrae and flexible cartilage of the lower spine. This area holds the weight of the upper body, and is supported by the hip bones. Therefore, nothing holds, pushes, or supports the lumbar spine from any direction except from the top and bottom when in its normal position. How did the Lumbar Spine turn into a Problem for Kayakers? The first kayakers, native Arctic people, sat on the floor of their kayak with outstretched legs, eliminating the need for lumbar spine support. For this reason native kayaks did not have a backrest, or any other means of support. When Westerners began using aboriginal kayaks they realized they had trouble staying upright with their legs stretched forward, in the L position. This is due they to the lack of sitting in this way in everyday life, and the muscles in their body were not adjusted. Rather than adjusting the passenger to the kayak, manufacturers and designers decided to change the kayak to match the paddler, introducing a system of back and foot rests engineered to clasp the kayaker in the L position, preventing the upper body from moving backwards or sliding forwards. The kayaker is supported by three non moving points in the kayak: two footrests and a back rest. By constantly pushing against those points, the kayakers legs give the force needed to keep the body in place. The legs have the most powerful muscles in your body, allowing you to run, jump, e.t.c. When you are stuck in the L position, your legs are constantly pushing against the kayak’s footrests, and against the lumbar spine, which is held in place by the backrest behind it. The hard, constant pressure on your lumbar spine comes at an unnatural angle, that is caused by the backrest. There is no solution to ease this pressure, when seated in this format, which is also the only possible posture allowed by Sit-On-Top kayaks and Sit-in kayaks. In other words, when paddling or fishing from a kayak, the only solution to relieve this stress and pain is to leave the kayak and stretch. Leaving the kayak to abate pressure on your lumbar spine is not a pliable option in most situations, and this is why most kayak anglers and paddlers continue to sit in their kayaks braving growing discomfort, and pain in their back. Try to imagine this situation as a fight between the very strong legs shoving your lumbar spine back against the backrest, and the less powerful muscles in the lower back that are attempting to protect the spine, and avert it from being injured. Luckily, your body will warn you of this, in the form of pain. The pain will tell you to stop this unhealthy “battle” between your legs and your back, before you get seriously injured. Disregarding this pain will lead to an increase in the severity of the problem, resulting in more pain, and ultimately to a more severe back injury. How much force do your legs exert on your lumbar spine in the L Position? We have measured the force as anywhere between forty and sixty pounds. To measure this pressure by yourself, position a bathroom scale upright between your lumbar spine the backrest of your kayak. Sit i your kayak as you would normally, and have someone read the dial for you. Even worse than this huge amount of pressure is that it is constant and unavoidable. More alarming than the total pressure is the pressure per area measurement, which would be alarming. Kayaking and kayak fishing instructors will tell you to sit straight as to better your kayaking style and perform more efficient torso rotations. Despite this, you must remember that the people who initially created and polished this style did not have backrests, as they did not need them. Therefore, theses first kayakers did not suffer from ‘Yak Back’ . In general, polishing your kayaking style will not improve the situation in your back: You will continue to experience discomfort and pain, and still be at risk of spinal damage. The clear reason for this is due to the fact that your legs will keep pushing your back. Sit-in and SOT kayak vendors will offer to “upgrade” your kayak to the latest “user friendly” seat, that is certain to be more expensive. Vendors will praise the extra cushioning of the seat on your hips and lumbar spine, claiming that these seats will nullify fatigue, leg numbness, and back pain. In reality, special kayak seats, that have been around for decades,have never produced the wanted effect of ending Yak Back. These seats don’t work, because all kayaks have a backrest by definition. No amount of cushioning will lessen the amount of force that your legs exert when they push that backrest against your back. These seats can be counterproductive, as the soft cushioning can lessen the pressure on softer tissues in your lower back, like skin, delaying the feeling of discomfort and pain in your back, and in its supporting muscles. The problem will surface when it as a more advanced stage, which is dangerous, from a health stand point. Of course you must avoid kayak fishing and paddling while in the L position, because it is harmful to your health, and sitting for long periods of time can lead to back injuries and long-term back pain. So, what is the ideal kayak? The ideal kayak would always be comfortable, and not damaging to your lumbar spine. But does such a kayak exist? Indeed a kayak that matches those criteria exists. The Wavewalk Fishing Kayak has no backrest, and instead has a saddle; This saddle is similar to that of a bike’s, snowmobile’s, and horse’s saddle, as well as that of many other’s. The common factor in these examples is that your own legs support body. This factor is great for your lumbar spine, as no unnatural pressure points are present. Secondly, the saddle seat of the Wavewalk Kayak offers a multitude of different stances, such as stand-up, and the option to change between two stances at any given time. Therefore, whatever ailment you feel in your back, or pressure in any part of your body can be relieved at your whim. As a result, kayak anglers and paddlers, who suffer back problems, say that even after spending lots of time in their Wavewalk kayaks do not feel discomfort or pain. 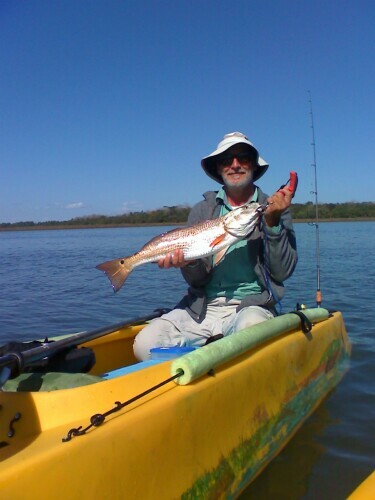 Reports on this can be found in fishing kayak reviews, where these anglers and paddlers state that without their Wavewalk kayak, fishing or paddling from a kayak would be nigh on impossible.